When discussing influential music towns of the ‘60s and ‘70s, it’s easy to go with places like Nashville, Muscle Shoals and Detroit. But it might come as a surprise to many that during this heyday for music, from soul to jazz to rock n’ roll, Gainesville, Florida was a hotbed for live music – both for popular touring acts, as well as local bands. The town has also produced a number of well-known musicians. The musical history of Gainesville, especially the type of music that rocks and rolls, is fondly celebrated on the website GainesvilleRockHistory.com. Developed by longtime musician Marty Jourard, the website is a digital gateway to the past; interviews, photos, posters, and newspaper articles take us back to a time when the likes of Janis Joplin, Ray Charles, Sly and the Family Stone, Elton John and James Brown all passed through Gainesville, performing at venues like Tom’s Tavern, the Florida Gym and Dub’s – just a notable few among many that were an important part of Gainesville’s music history. Growing up in Gainesville, Jourard was a big part of the music scene of the early ‘60s to mid ‘70s, having played in a number of local bands. One band was Road Turkey, which included Stan Lynch, future member of The Heartbreakers. In fact, in the early ’70s, Road Turkey played many shows alongside Tom Petty’s band, Mudcrutch. Jourard and Petty have remained friends all these years later. Jourard eventually left Gainesville in 1976 for the bright lights of Los Angeles. He later joined his brother, Jeff Jourard, in the popular ’80s band The Motels, as keyboard and saxophone player. Feel free to begin singing “Only the Lonely” or “Suddenly Last Summer,” if you’d like. Jourard’s endeavor to chronicle the history of the ‘60s and ‘70s Gainesville music scene extends beyond the Internet. He is currently writing the forthcoming book Gettin’ Down in Gatortown: The Rock ‘n’ Roll Roots of Gainesville, Florida. In starting the book, Jourard has taken what was initially nothing more than a scrapbook of memories and providing a narrative arc, developing a storyline that will no doubt generate excitement about the musical days of Gainesville in the ‘60s and ‘70s. “It’s part chronology, part social history, part memoir and part biography,” Jourard said. 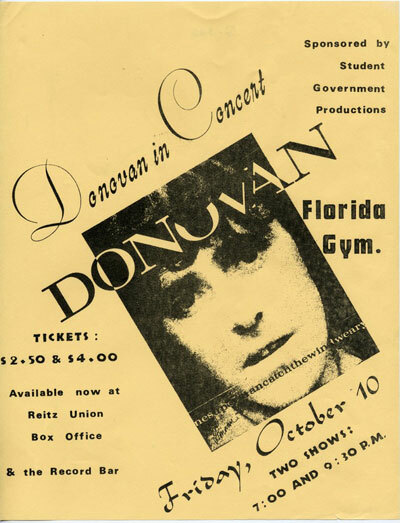 Between the big name acts passing through, and the local bands playing night after night in bars, lounges, fraternity houses and roadhouses in and around town, Gainesville proved to be an important training ground for many musicians motivated for big success. And Gainesville boasts an impressive number of musicians in the Rock and Roll Hall of Fame: Stephen Stills, Bernie Leadon, Don Felder, Tom Petty, Stan Lynch, Mike Campbell, Benmont Tench and Ron Blair. Each of the above-mentioned musicians was either born and raised in Gainesville, or spent a good deal of their youth here. Now living in Kirkland, WA, Jourard has kept busy since The Motels disbanded in 1987. There have been new bands, writing books, teaching music, and the founding of Rock School, a non-profit, after-school program where young musicians can learn instruments, songwriting and how to record their own CDs. In 1997 Jourard wrote Start Your Own Band. With an introduction by Tom Petty, the book is an insider’s guide to the music business, helpful insight gathered from Jourard’s years as a professional musician, covering everything from dealing with record companies, where to get cheap equipment, rehearsals, and much more. Decades removed from Road Turkey, and now living on the opposite coast, Jourard still has a strong connection to Gainesville and his early days playing rock n’ roll. Sean McNamara originally wrote this for the website Gainesville Obeserved.